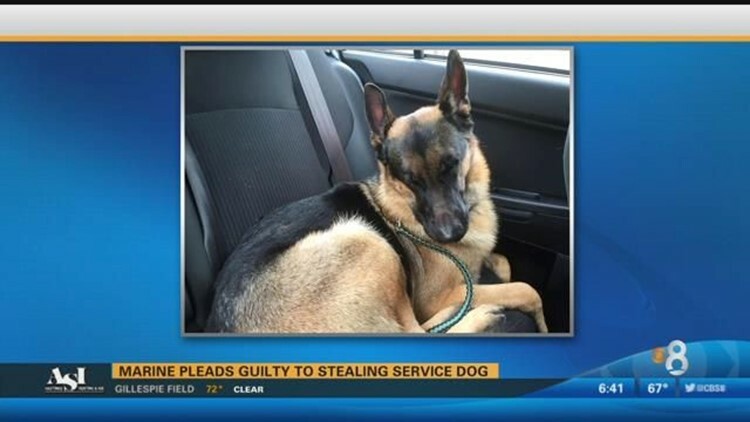 VISTA (CNS) - A Camp Pendleton Marine who stole his ex-wife's service dog from her Vista home pleaded guilty Tuesday to a misdemeanor theft charge and was immediately sentenced to five days community service and ordered to pay $1,452 in restitution. Pablo Cortes, 34, was also ordered to undergo a year of counseling and to stay away from his ex-wife, Alexandra Melnick, and her German shepherd Kai for the next 10 years. Kai went missing from Melnick's home around Thanksgiving 2014. Melnick, also a Marine who served in Afghanistan, launched a major search for Kai, a registered service dog that she said helped her cope with post-traumatic stress disorder. Kai was found nine months later in Texas with Melnick's former father- in-law. Melnick maintained that the dog was always hers. She said the defendant probably took Kai to his father's home in Texas during a deployment.